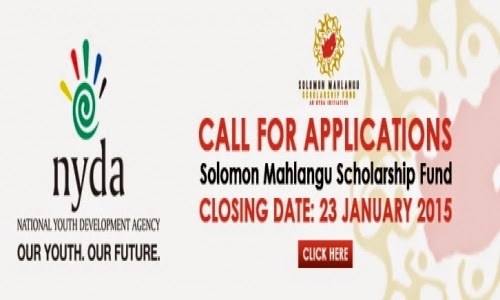 2015 NYDA's Solomon Mahlangu Scholarship Fund: The Solomon Mahlangu Scholarship Fund, a fund of the National Youth Development Agency (NYDA), is now accepting applications for the 2015 scholarships. students who excel in the classroom and wish to pursue studies in scarce skills at Universities, Universities of Technology as well as all public Further Education and Training (FET) Colleges. Established by the NYDA in 2013 the Scholarship Fund was officially launched by His Excellency, President Jacob Zuma in February 2014 where the NYDA also unveiled the first group of its beneficiaries. With additional financial assistance from the Department of Higher Education the Solomon Mahlangu Scholarship Fund, last year alone, awarded R20-million in scholarships to 236 students from previously disadvantaged backgrounds, across South Africa, for the duration of their studies. “We are pleased, once again, to offer young matriculants a chance to apply for the scholarship that will ensure they get to attend the best academic institutions in the country because the NYDA has made it possible. We also want to invite private and public institutions to come on board and partner with us to make it possible to put more young South Africans at institutions of higher learning,” says Yershen Pillay, Chairperson of the NYDA. The Scholarship Fund, which the NYDA is striving to make the biggest on the continent, will benefit deserving South African youth who meet the minimum entry requirements set by the NYDA - youth who have been admitted for study at Universities and Universities of Technology and Further Education and Training Colleges across the country. International scholarships will be considered if they have been endorsed by a South African government department or a credible public or private agency. Applications are to be made directly to the participating University/University of Technology which has full responsibility for receiving, processing applications and selecting recipients. Application forms are available on the NYDA website and all NYDA branches. The deadline for new applications is 23 January 2015.